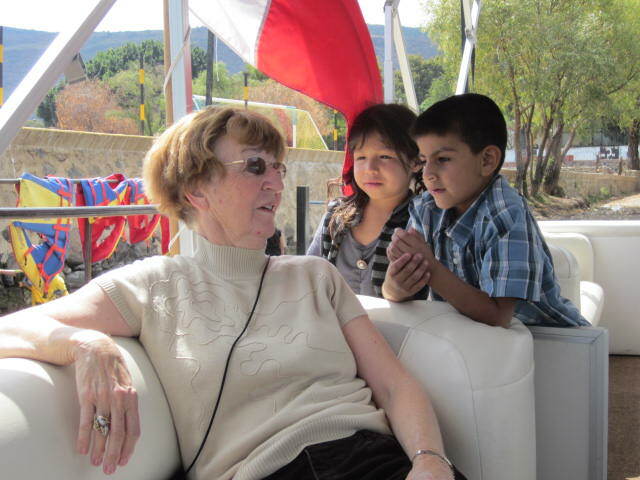 I went with my friend Valerie on a boat ride across the lake to San Luis Soyaltan. It was exciting. I love to be out on the water. This boat can be found at the pier in Ajijic. Right now, it only runs on Friday, Saturday, and Sunday. It stays in San Luis Soyaltan and is only at the Ajijic dock a little while before they take off again for San Luis Soyaltan. 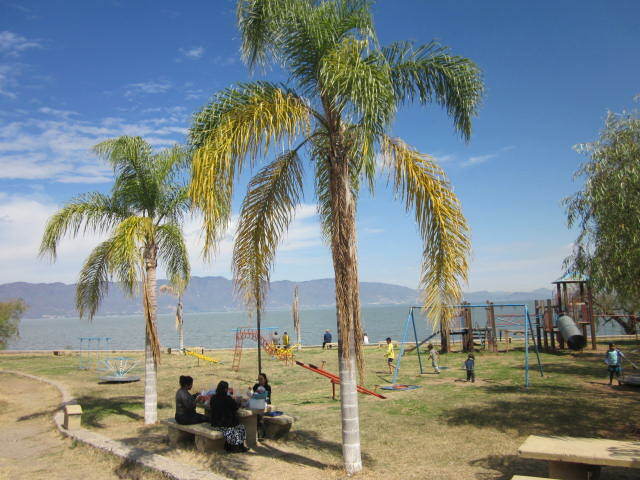 I found out about it through friends at the Lake Chapala Society. There are no signs up on the pier. They have just been in business a few weeks and most of their advertising is by word of mouth. I have nothing but good things to say about the trip and the people who run it. They were all very friendly and helpful. 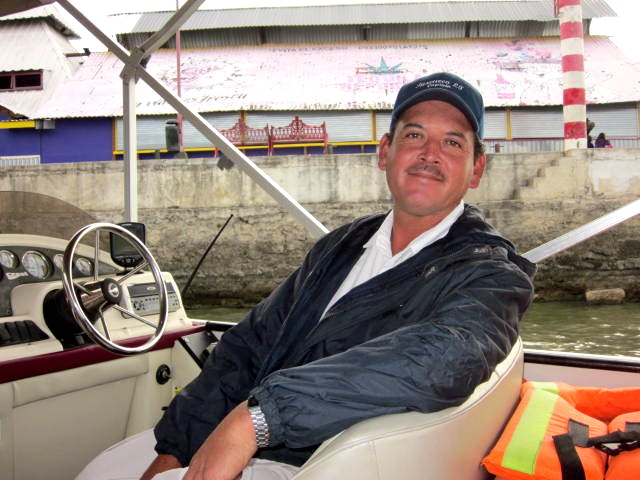 Above are photos of the boat and the crew; Salvador, the ticket man, Martin, the Captain and Maria, the helper. Maria gave me an extra jacket when she noticed that the one I had brought wasn’t very warm. She also offered me a drink at a small price. They have beer, coke and water. I took the coke. 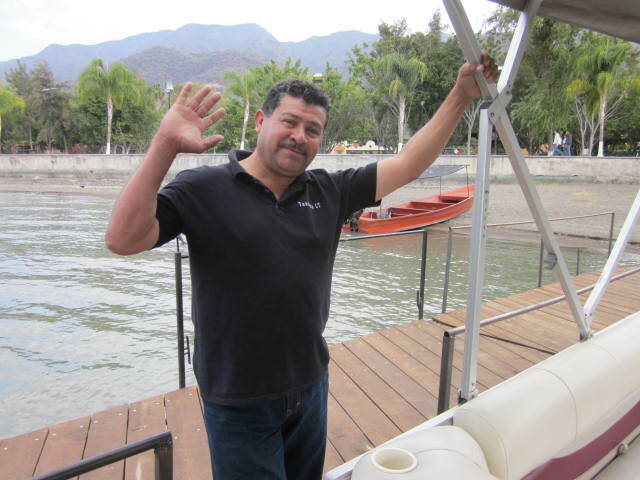 It was cold and tasted great as we zipped along the water towards San Luis Soyaltan. 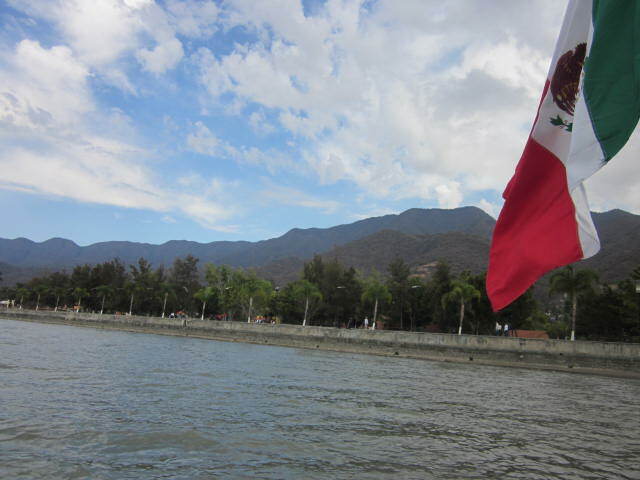 I enjoyed seeing the Ajijic malecon as we left the dock. 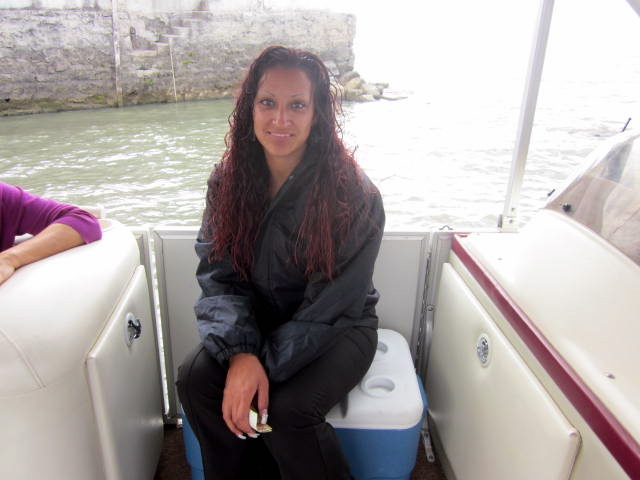 As you can see, it was a cloudy day but it felt good to be out on the water. 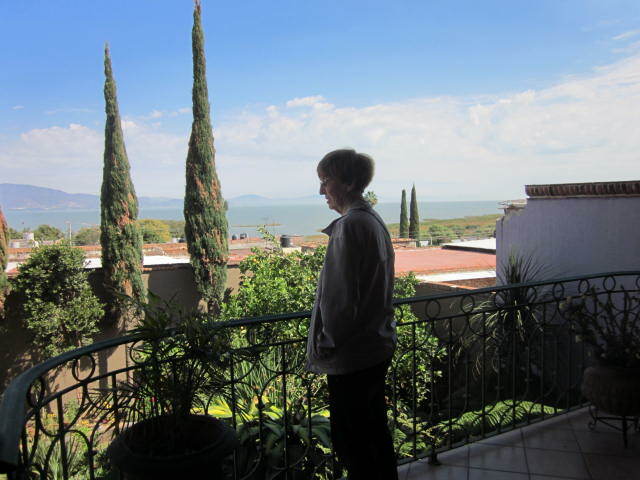 I have watched the lake for many hours from that malecon and it was a pleasure to see it from a distance. Few people were out that day. There were only three of us customers in the boat. That made it possible for me to stretch out and put my feet up on the soft benches. I felt like a queen. 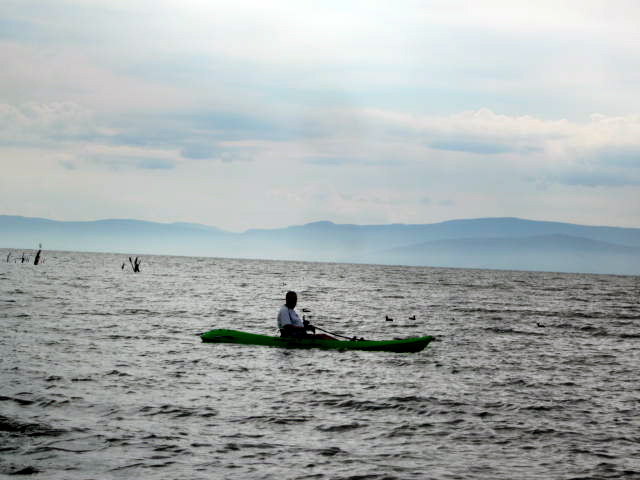 We passed a man kayaking on the lake. 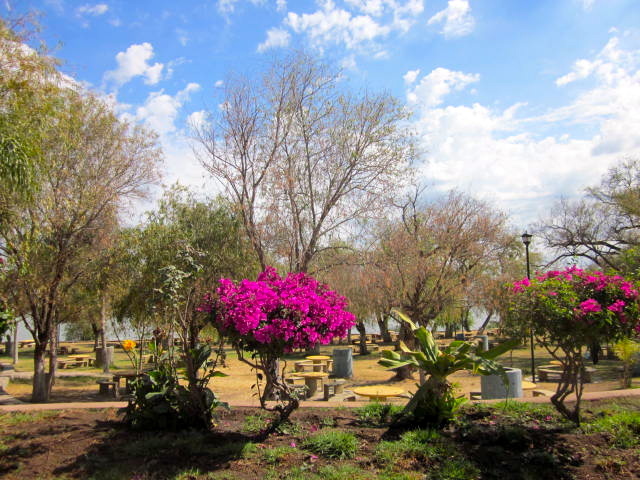 What always surprises newcomers here is how little the lake is used for recreational purposes. Lately a kayak club has been formed. They go out once a week and of course the fishermen use the lake all the time. But mostly the lake is quiet with few boats on it. 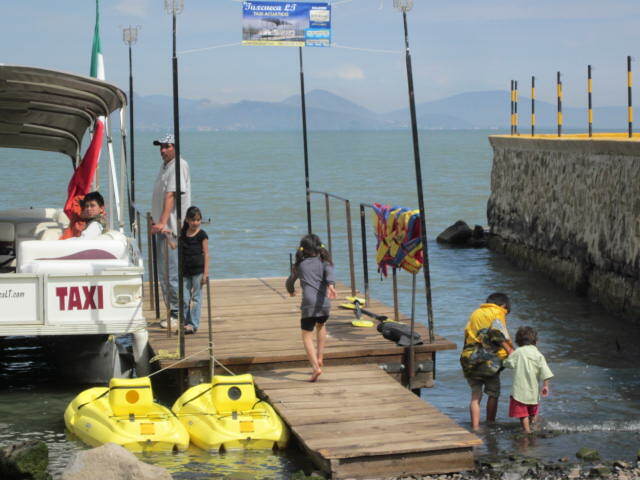 There are several boats that go out from the Chapala malecon. This is the first boat that I know about that now leaves from Ajijic. What a treat. 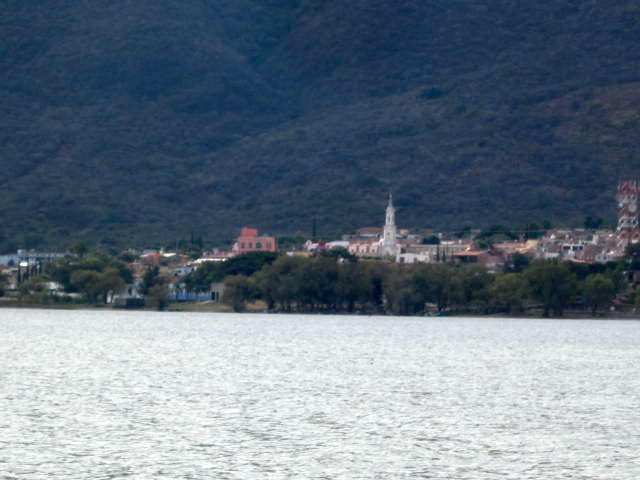 It only took us thirty five minutes to get across the lake to the small town of San Luis Soyaltan. I have written another article about this town. You may be interested in looking at it and seeing the photos I posted. It is a lovely town with few expats. One of these days it will be discovered and the property values will rise. But for now, it is unspoiled. 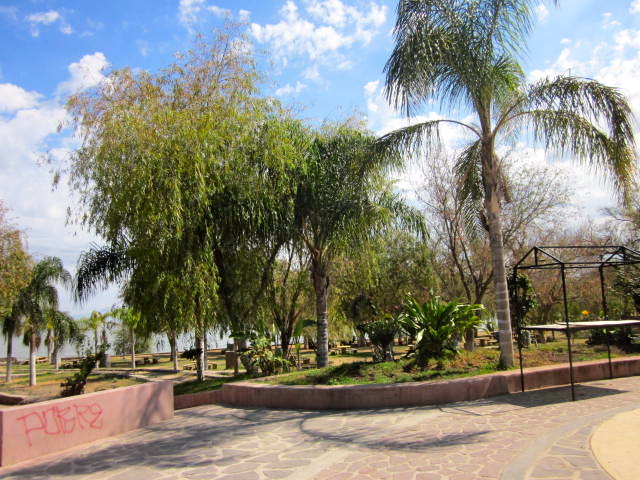 This is a new malecon at San Luis Soyaltan. The government has been investing a lot of money into making beautiful malecons in all the towns around the lake. This one is as pretty as any of the others that I have seen. 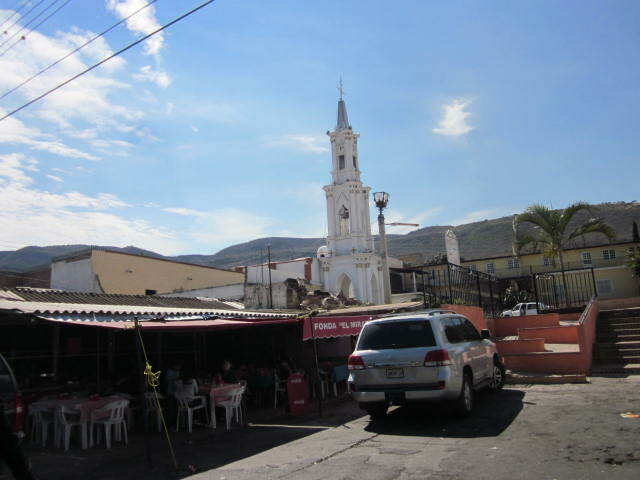 It is an easy and short walk to the center of town from the malecon in San Luis Soyaltan. The homes are simple and unpretentious. There are many choices of places to eat lunch. 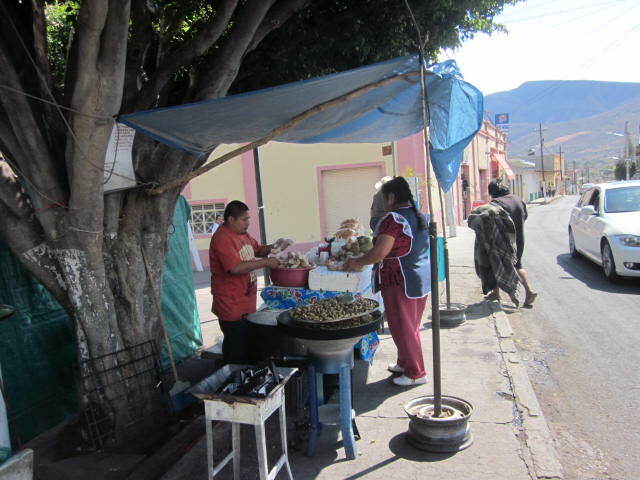 You can get something from one of the outdoor stands, or more established restaurants, like the one above. 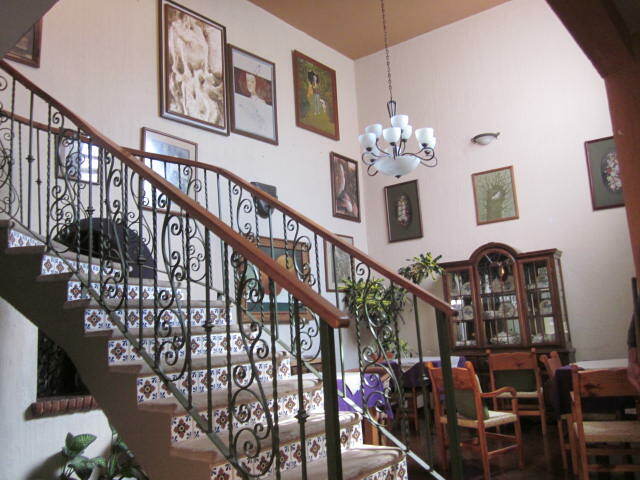 Or if you have more time, you may want to try the beautiful Bed and Breakfast and Restaurant, Los Crotos, which is on the way to the plaza. There is only one hour from the time the boat docks and returns. 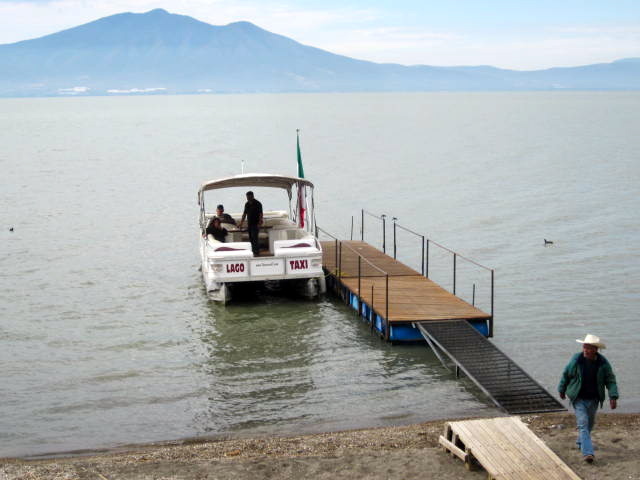 So if you want to eat there you have to take the last boat that returns from San Luis Soyaltan. Or you may want to book a room and have a two days in the town. Then you can take the boat back the second or third day. It runs Friday through Sunday and it doesn’t matter which day you come back. 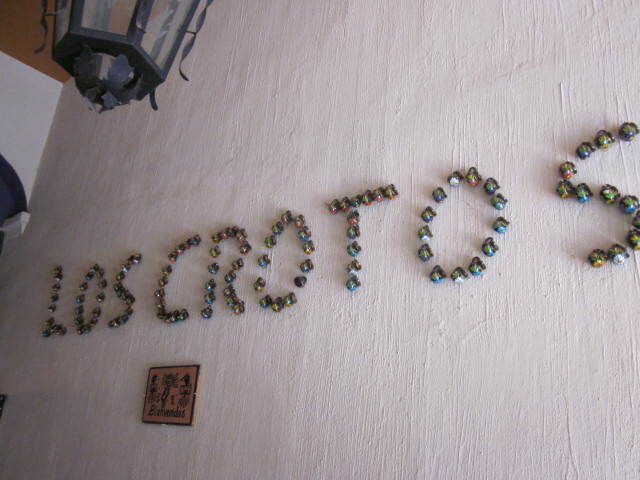 The Los Crotos Sign is made out of tiny pottery and hand painted jugs. Valerie and I didn’t have time to eat lunch at Los Crotos but people have told me that their lunches are delicious and very inexpensive. If you are interested in booking a room at Los Crotos call: (01-376) 764 0067. Or E mail: arturo@loscrotos.com. 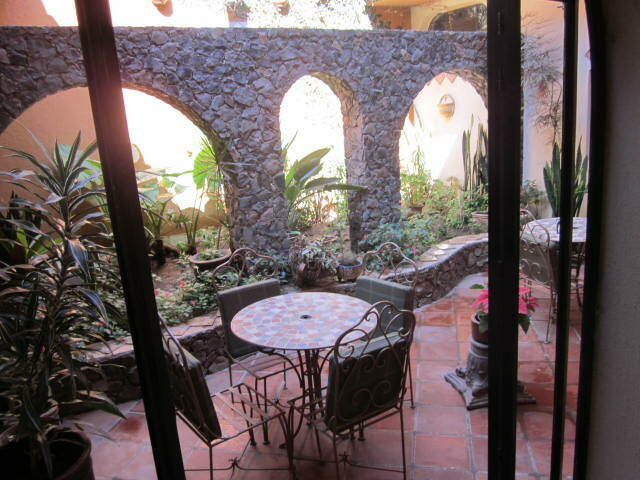 Their address: R. Corona #31 The rooms are lovely. These children weren’t going to take the boat ride with us. They were just interested in Valerie. They were a lot of fun to watch as they splashed around in the water. 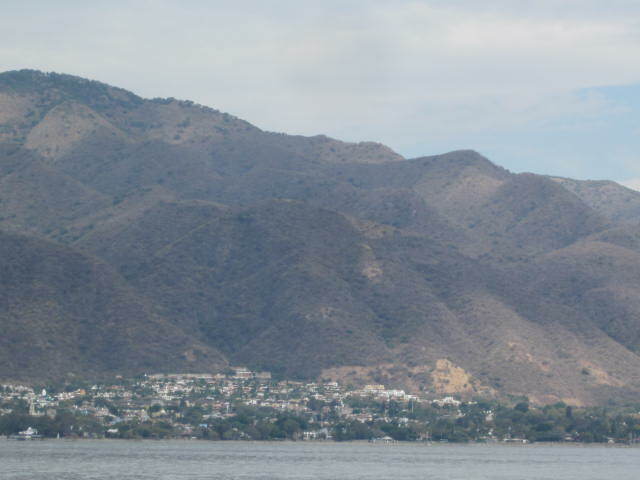 What surprised me on our return to Ajijic was how small the town looks compared to the mountains. One day the mountains may be covered with houses. Enjoy it while you can now. I highly recommend the boat trip. It leaves Ajijic at eleven am, 2 pm, and 5pm. 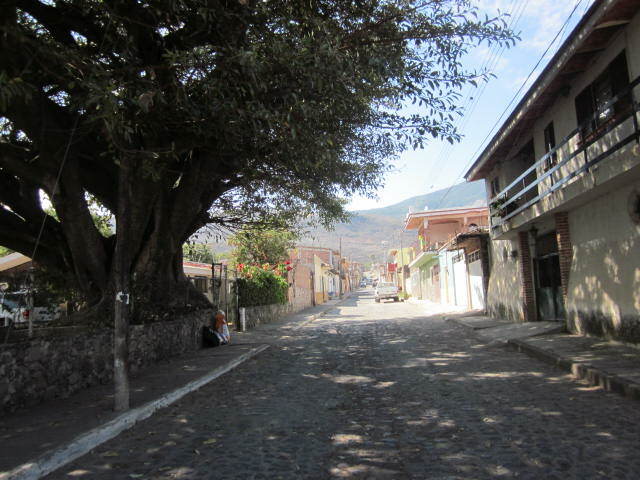 It leaves San Luis Soyatlan at 10am, 1pm. and 4pm. Their phone number: 333 132 4138. The cost when I went was only 75 pesos each way. It may be more now. That was a promotional price a few weeks ago. Very nice info…looks like a great little day trip. Hope to see it someday. Hi: Great info! But can you update the town’s spelling? 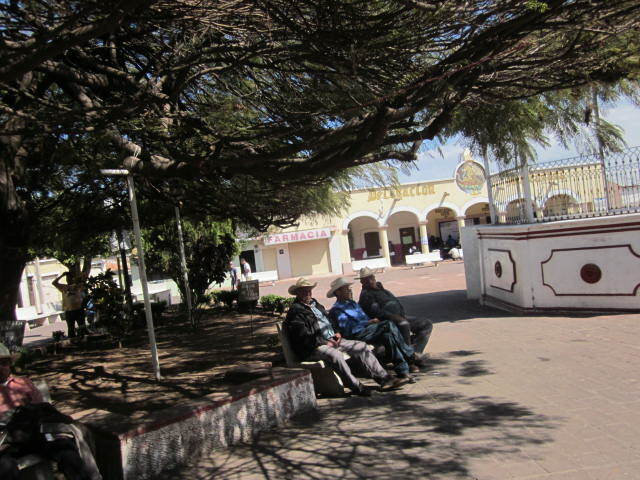 It’s actually spelled “San Luis Soyatlán”! Thanks.